There isn't any other rally that finishes with champagne - and a pie, but the Tunnocks Mull Rally did in the early hours of this morning. Whilst the winning car was dosed with sparkly, Fergus and Karen Tunnock dispensed Tunnocks pies to the crews, including the winners. Scoring an emphatic first victory on home soil were John MacCrone and Stuart Loudon. 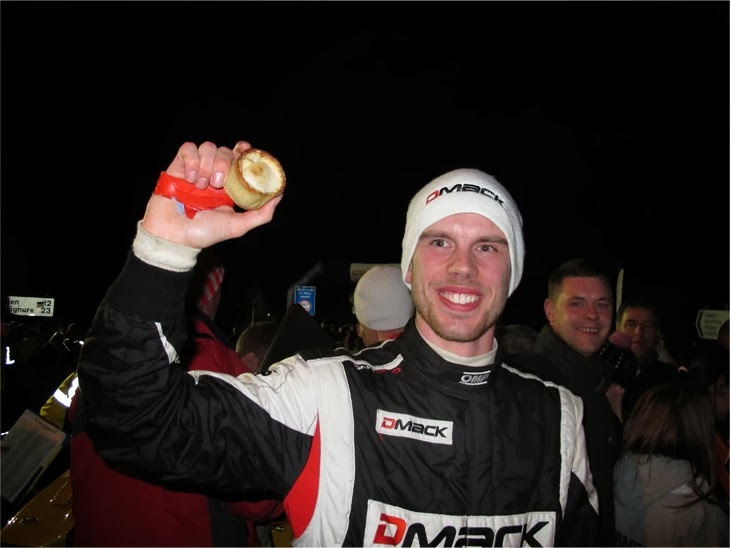 At a tear streaked and champagne soaked finish, the MacCrone family were there in force to share in John's success: "It's unbelievable," he said, "first time out in a 4WD car. It's been bloody difficult to get here, but my ultimate ambition still remains, to win the Tunnocks Mull Rally in a MkII." He added: "The guys at CA1 did a brilliant job all weekend. This was a fair car to drive and I'm so grateful for the opportunity. It was also so much fun." Peter Taylor scored a superb second and was very philosophical at the finish. At the start of the Final Leg there was a glimmer of victory: "That first stage tonight, it was either bin it or get a shitload of time back, and all I got was a pathetic off! The front dampers were going off and with 5 miles to go on the last stage, my brakes were gone." Even so it was remarkable run for the youngster. Eddie O'Donnell equalled his best result, third in 1997, to win the top 2WD award and said: "I'm just happy to finish without a problem. In the past it has been trivial wee things that have tripped us up, but we were lucky tonight too. When the starter motor failed, James MacGillivray and Roy Jarvis got me a replacement." The victors were greeted by a huge and noisy crowd at Dervaig, Calum's home town. It seemed they had all turned out to greet the Fiesta as it crossed the bridge and under the Tunnocks arch to rapturous applause. A popular victory indeed, and John paid due tribute to Calum Duffy: "It would have been nice to see him here at the finish, and have a fight all the way, but I rally felt for them when I saw the car off in Ardtun and Del trying to heave the thing back on the road." And so to bed. Weary, wabbit and worn out, but what a rally.